Is a bagel bread? I say it is. The Oxford English Dictionary says it is ("a hard ring-shaped salty roll of bread"). From what I can tell Jewish people consider the bagel to be bread. Truth is, I can't imagine anyone thinking the bagel is not bread yet, the Irish government does. As far as the government is concerned, bagels are not bread. Last week the Irish Times revealed that Ireland's Revenue Commissioners (the Irish version of the IRS) are dusting off an old law as to what constitutes bread. Those products that don't meet the definition will now be subject to a 13.5% Value Added Tax (sales tax) rate. Bread incurs no VAT. Lest you think this is an attack directed against Ireland's tiny Jewish community, it is not. Bagels were non-existent here until about a dozen years ago, but now they are widely produced by non-Jews all over Ireland. Besides, it isn't just bagels that the revenue officials are targeting. Croissants, garlic bread and other 'fancy breads' that became widely available here during the Celtic Tiger years are also in line for the extra tax treatment. According to the Irish government, bagels and the rest are "not sufficiently bread-like to be exempt from VAT." The law defines bread pretty specifically based on ingredients and the cooking process. As far as the law is concerned bread is produced by "baking dough composed exclusively of a mixture of cereal flour" and any of the ingredients on their list. Those ingredients include fruit and milk, but not eggs or garlic, which is why croissants and garlic bread do not fit the definition. 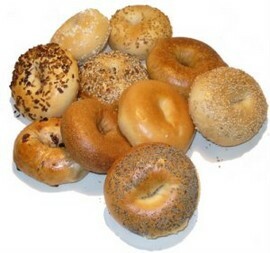 Bagels are excluded because the dough is boiled before it's baked. Unless seeds can be included as "dried fruit" a lot of "fancy breads" topped by sesame or poppy seeds are also excluded from the legal definition of bread. Of course loads of bagels come with sesame seeds or poppy seeds or onion or garlic or cinnamon, which only further emphasizes how far from bread they really are in legal terms. Well, ostensibly our broke government is simply looking for some extra dough. Enforcing a long-neglected law on bread is just one more way to raise revenue. However, I think there's a deeper philosophical underpinning at work here, one that runs counter to what I wrote last week. By breathing new life into this moldy old law the government is telling the Irish people to stop eating that "foreign muck" and get back to eating "real bread." And by real bread they mean something your Irish granny used to make. Traditional Irish soda bread or brown bread is recommended, but good old-fashioned white bread, unsliced, is also fine. This is the government's subtle way of telling us that all those foreign influences we've imported during the past 40 years of European Union membership are comming to an end. Maybe they think the EU is coming to an end or maybe just our involvement in it. Regardless, this is clear evidence that the government's love of the EU has grown a bit stale. If they really believed in our long term future in the EU they'd realize that a narrow, Irish-only definition of bread would not survive a challenge brought to a European court. I mean, even Irish people seemed stunned to learn that bagels and croissants are not bread. Is a French or German or Polish official going to concede that bagels and croissants are not bread? Unlikely. The government's 'let em eat brown bread' attitude ties in neatly with their constant cries of austerity. It also ties in well with the philosophy that drove Ireland's governments between 1922 and 1960, when people endured some significant financial hardship in order to build a new, independent Ireland. This is the first official hint that we are heading back in that direction. I'm curious to see what else they've got cooking.